Over the past few months, Elk County has partnered with CGI Communications to refresh the "Video Tour Of Elk County" on our website. If you scroll down on any webpage, and look to the right, you'll see the new video tour link. The video tour is separated into 8 chapters so please be sure to view them all. We certainly do have much to be proud of here in Elk County. The Elk County Planning Department in cooperation with the Elk County Emergency Management Agency has prepared an update to the Elk County Hazard Mitigation Plan. County officials began developing the county’s first Hazard Mitigation Plan (HMP) in 2006. The Plan was approved by FEMA and adopted in 2011. However, local Mitigation Plans must be updated at least once every five years in order to continue to be eligible for FEMA hazard mitigation project grant funding. In order to meet FEMA’s requirement, the Updated HMP was prepared. The Elk County Sheriff's Office, Elk County 911, and Life and Independence For Today (LIFT) have partnered together to bring Project Lifesaver to Elk County. What do people who suffer from Alzheimer’s, dementia, autism and down syndrome all have in common?....... The tendency to wander. Project Lifesaver is an award winning program consisting of police, sheriff, fire, public safety departments and other emergency responders. The individual with tendencies to wander wears a small transmitter on their wrist or ankle that emits a tracking signal. It looks similar to a watch, but sends out one of three transmissions: radio frequency, global positioning system (GPS) or assisted global positioning system. When the individual is missing, a call is made to Project Lifesaver to explain the situation. They, in turn, will contact local responders with coordinates of the individual based on the tracking signal being sent. The responder now knows exactly where to look, saving crucial time. More information including how you can help is located on the Sheriff's Webpage. 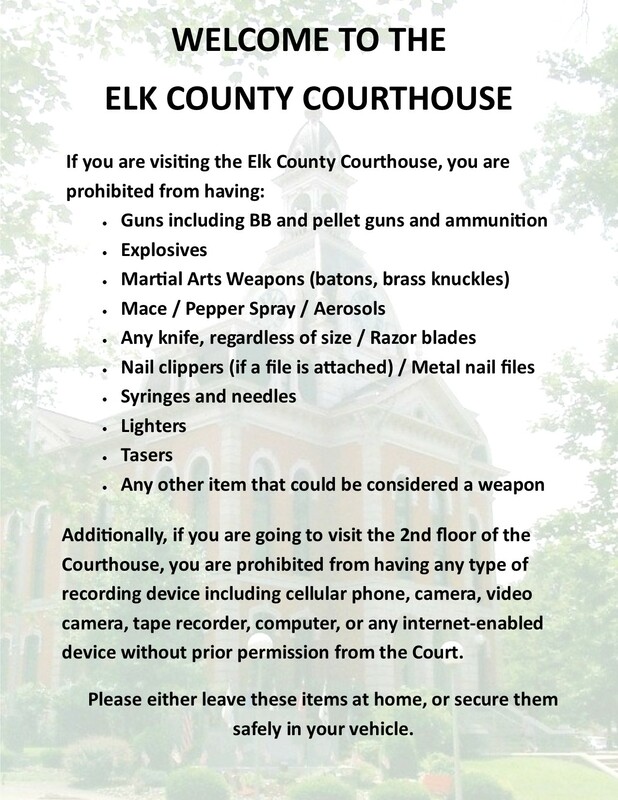 If you plan to visit the Elk County Courthouse, please take a moment and review this memo of what items cannot be brought into the Courthouse.